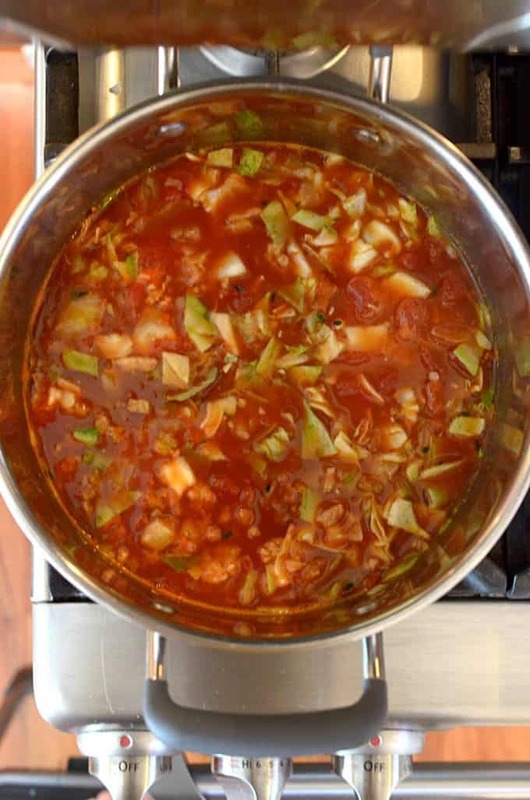 Cabbage Soup – When the temperature starts to decline, a couple of things happen. The first thing is that I go right to my closet and get out my favorite flannel shirt. The second thing that I do is grab a big soup pot so that I can make a wonderful batch of deliciousness for my family. 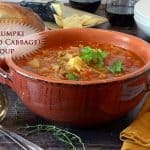 What’s even better is when you can take a great recipe like my Golumpki (Gołąbki, Stuffed Cabbage) and turn it into this easy Cabbage Soup, or if you prefer, cabbage roll soup. We model this cabbage soup after our popular Golumpki recipe (authentic Polish cabbage rolls). This unstuffed cabbage roll soup starts with fresh cabbage and ends up as a bowl of savory comfort food. This easy soup recipe is ready from start to finish in just 45 minutes! 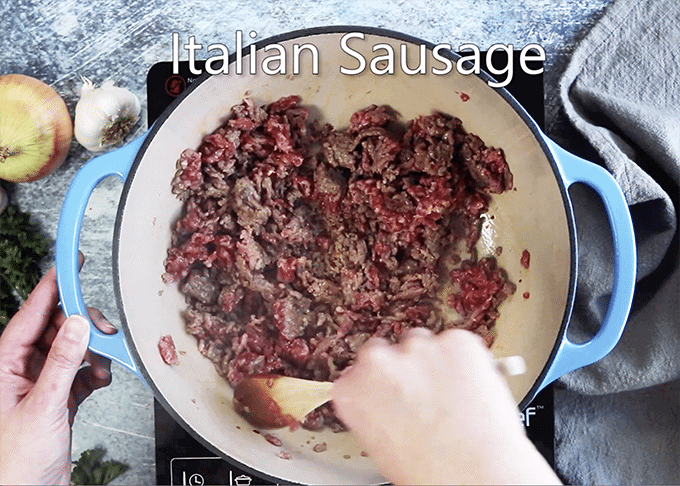 We like adding Italian sausage to our cabbage soup recipe. 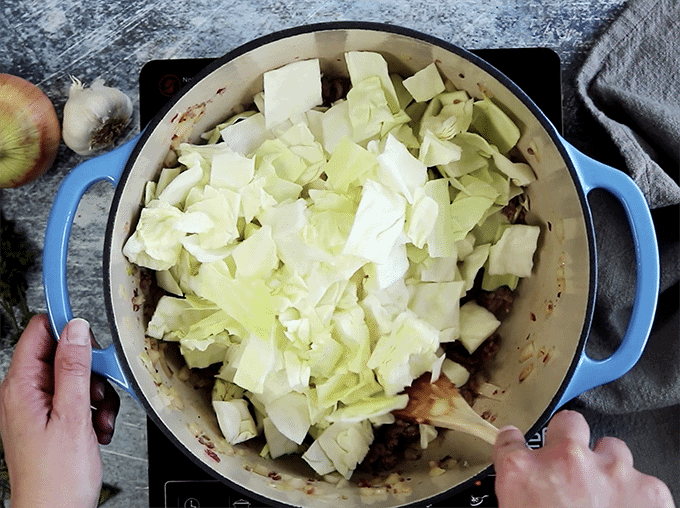 To make this cabbage roll soup, start by browning one pound of sausage. We prefer Italian sausage and to save a few fat calories, we like to use turkey sausage. 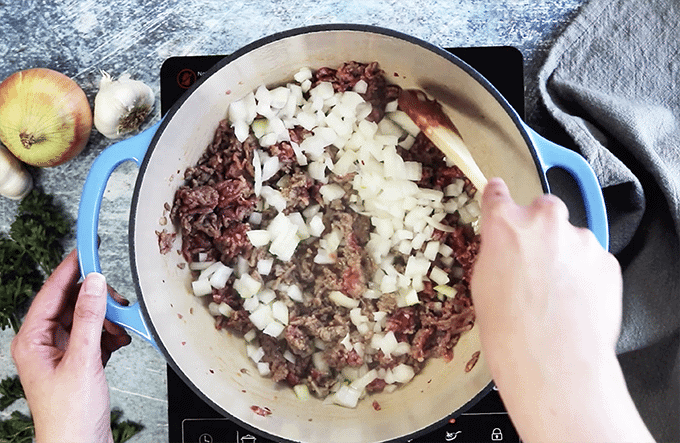 Add a chopped onion to the browned beef. Next, you will add a chopped onion to the brown sausage. Stir it around until it softens, and this will add a nice savory flavor to this stuffed cabbage soup recipe. Stir in the main ingredient! Green cabbage is the most common, but feel free to use a purple cabbage to add some color to this cabbage soup!. Garlic and rice give this cabbage roll soup some extra body and oomph! 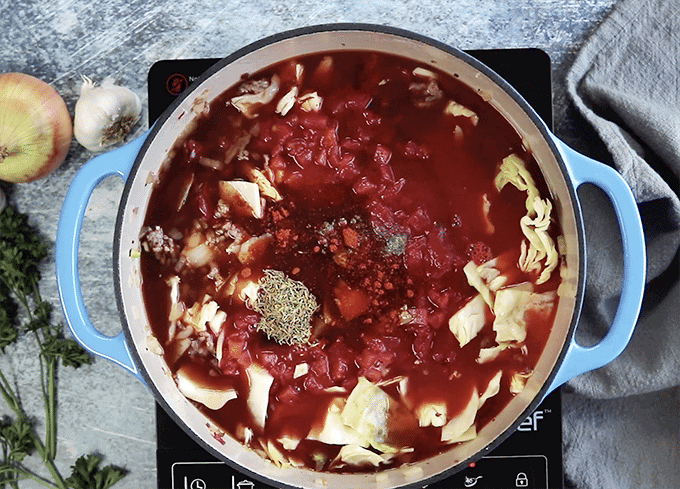 Add tomato paste to this cabbage soup for flavor and structure. 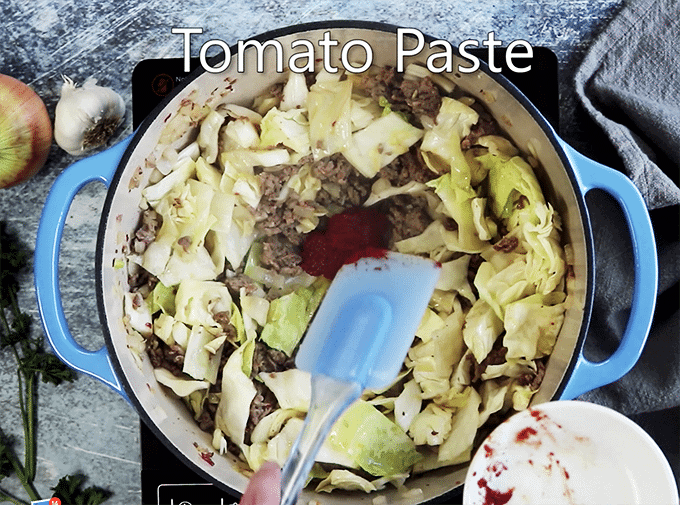 Anytime you add tomato paste to a recipe; you should gently brown it first. Doing so will slightly cook the tomato paste making the flavor a bit sweeter through the caramelization process. 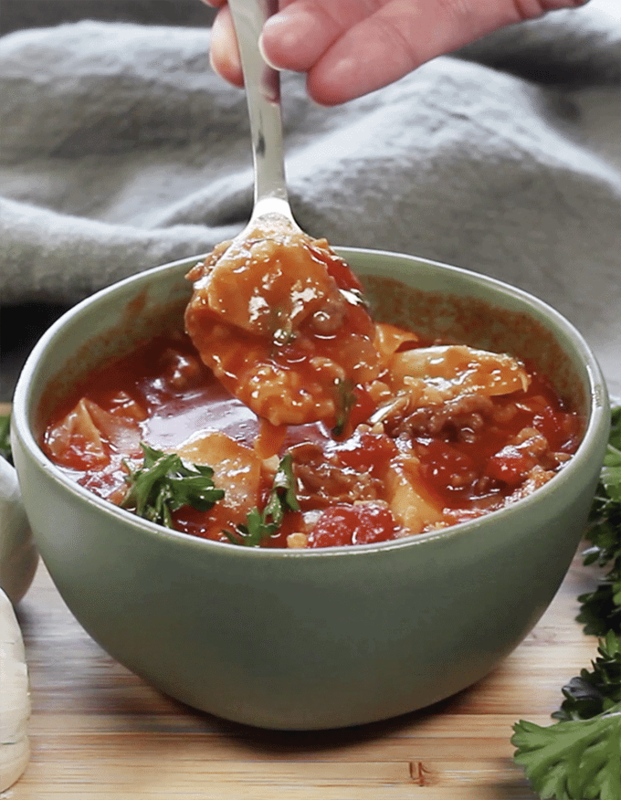 Diced tomatoes give this unstuffed cabbage soup a nice flavor and texture. Once the tomato paste is browned and stirred in, add one 28 oz. 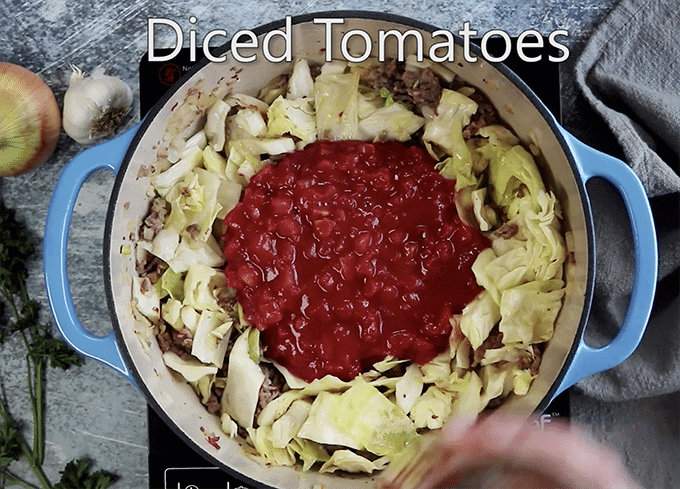 Can of diced tomatoes to this cabbage soup recipe. If you can find unsalted or reduced sodium diced tomatoes, use those. 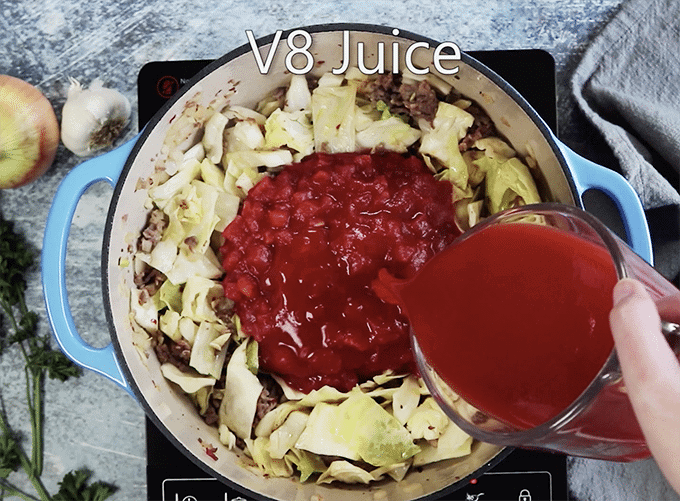 V8 juice will add a lot of flavor to this cabbage roll soup. 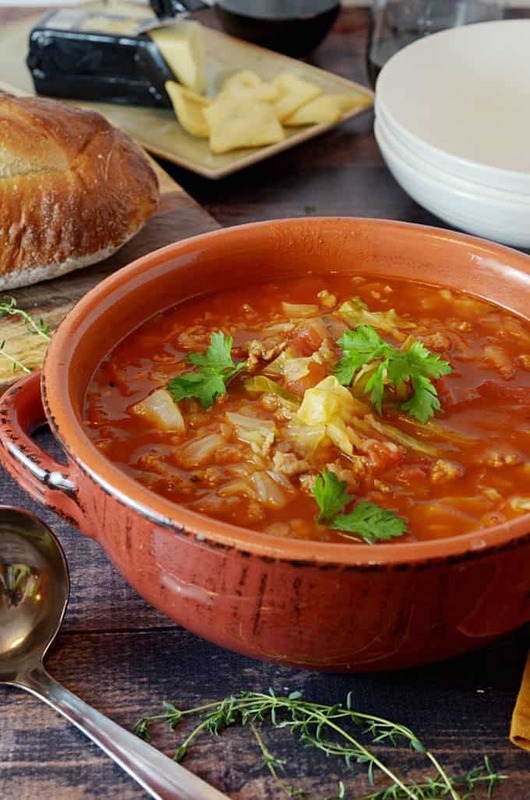 V8 juice will give loads of flavor to this cabbage roll soup recipe. Once again, save a ton of unwanted salt and use the reduced sodium variety if you can find it. Beef broth gives volume and flavor to this cabbage soup. Now you’ll stir in some beef broth for this unstuffed cabbage soup. Homemade broth is always best because you know what’s in it and what isn’t in it, IMHO. If you have to use store-bought beef broth, once again, reduced sodium is best! 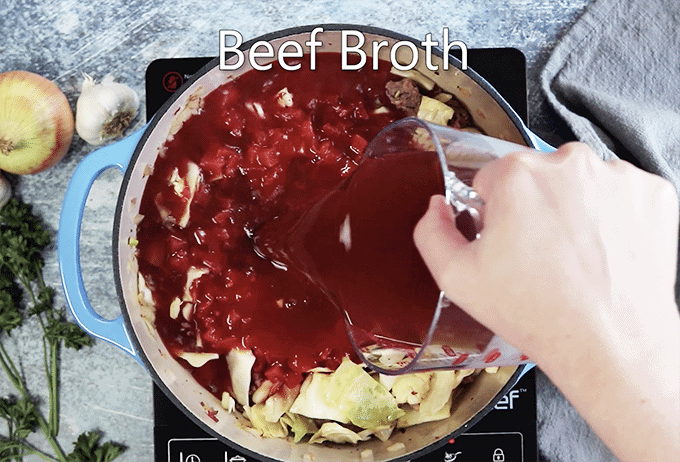 Have you ever asked,”What’s the difference between broth and stock?” Click the link, and we can help explain it! 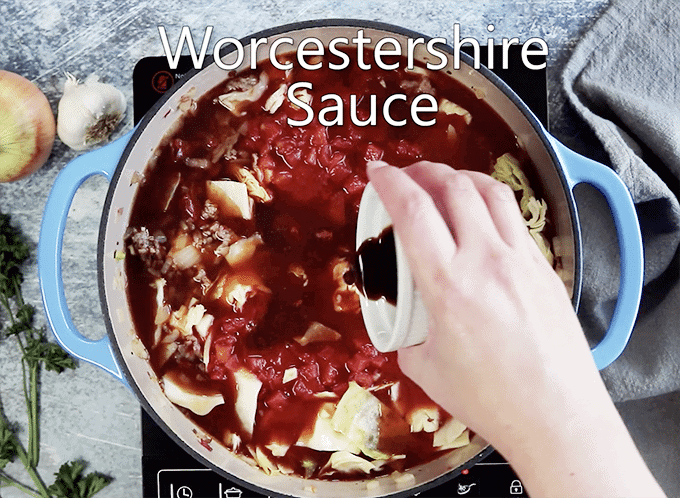 For a flavor boost to this cabbage soup, stir in a little Worcestershire Sauce. Thyme, paprika, salt, and pepper help finish off this cabbage roll soup. 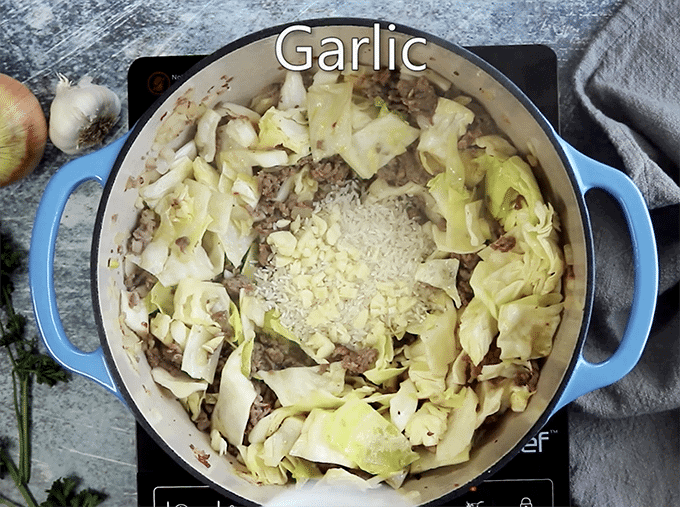 Finally, the hard part about this savory cabbage roll soup: Allowing the ingredients to get to know each other. Once you have everything in the pot, you’re going to cover it and allow it to simmer for about 25 to 30 minutes. It takes about a half hour to simmer this cabbage soup, but it’s SO worth the wait! While this pot of cabbage soup is simmering, you may want to consider slipping a loaf of our homemade crusty bread into the oven. I can’ think of a better match! My Golumpki recipe is pretty popular here on Platter Talk, but it is also very popular on Google when people are searching for a stuffed cabbage recipe. It’s the most popular recipe for cabbage rolls in the land. 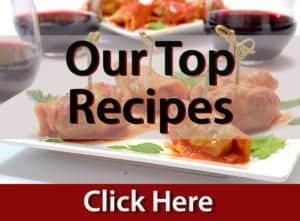 The Number One Ranked Golumpki Recipe on Google, from Platter Talk. Thus, it was a no-brainer for me to want to try and recreate our winning recipe into a great Golumpki Stuffed Cabbage Soup recipe. I know that many people love Golumpki. I also know that many people shy away from trying to make it. The simple reason for this is because making cabbage rolls from scratch requires many steps. The steps and the recipe itself are very easy; there are just many steps. Because of this, I created a “lazy” approach and turned it into a casserole. 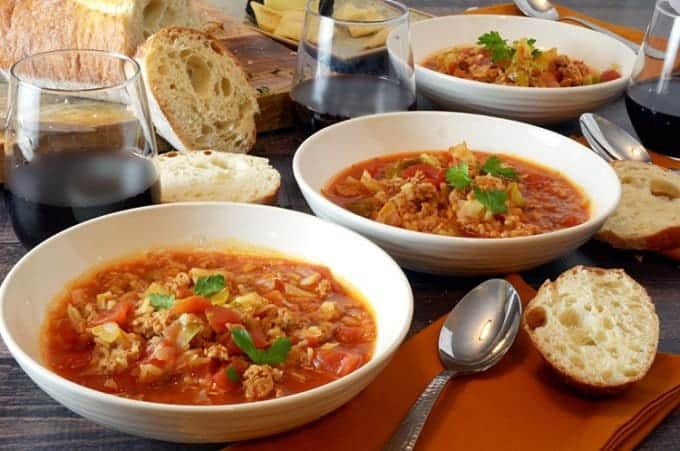 Now, it gets even easier with this cabbage roll soup! This hearty soup recipe can be put together in a matter of a few minutes. The longest part of the process will be the 25-30 minutes you have to wait until the cabbage is softened and the flavors have come together. 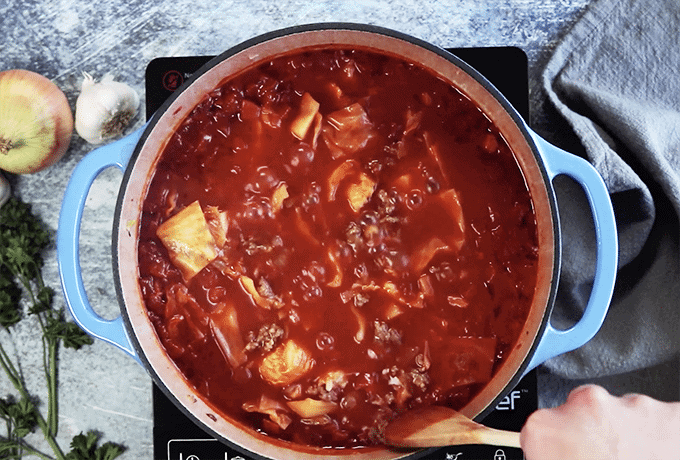 Because of this, Cabbage Roll Soup is great for a weeknight fall and winter meal. Make this Cabbage Soup soon! We made this pot of soup on the stove in one of my favorite pots. But, once you brown your meat, you could quickly put all of the ingredients in your slow cooker and let it simmer away for hours. How is that for convenience? 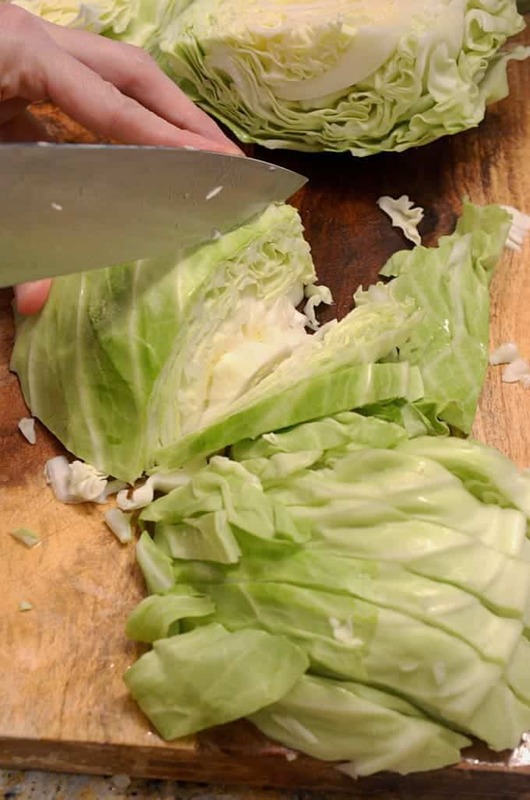 Can You Freeze Cabbage Soup for Later? Absolutely! This cabbage soup freezes well for an easy and delicious leftover meal. 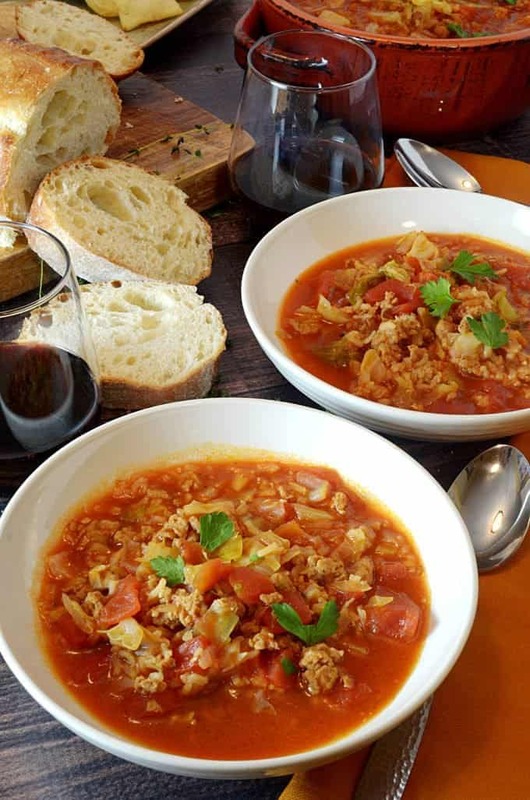 Try one of our easy bread recipes with this cabbage roll soup. 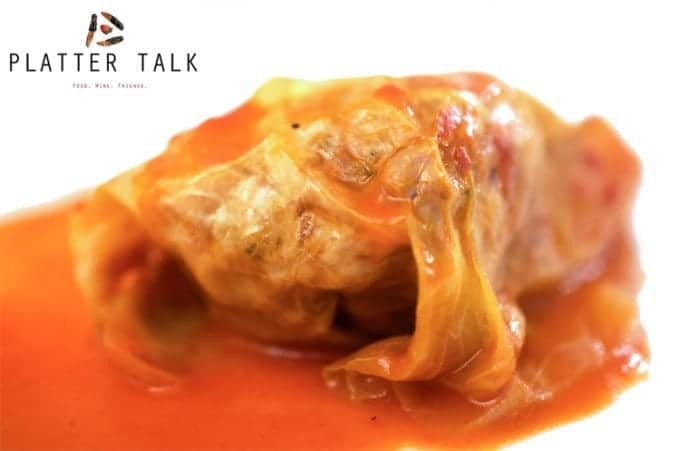 Stuffed Cabbage Soup from Platter Talk features an authentic Polish stuffed cabbage recipe that is made into a soup. Enjoy a bowl of this cabbage roll soup today! In a stock pot, over medium heat, brown the turkey sausage. Add onions to pot and cook until onions soften. Add cabbage to pot and cook until cabbage starts to soften, maybe about 2-3 minutes. Push ingredients to the edges of the pot to create an opening in the middle of the pot. Add tomato paste and cook until tomato paste starts to darken, about 1-2 minutes. Stir in remaining ingredients to the pot and allow soup to come to a slight boil. Lower temperature to a simmer and cover. Cook for approximately 25-30 minutes or until the cabbage and rice are softened. Pin this Cabbage Soup Recipe for Later. Hi Joyce. Thanks for your question. The soup calls for 1/2 cup uncooked rice. You add the uncooked rice after you brown your tomato paste. This can be found in step 6 of the instructions at the bottom of the post. There is also a video of me making the soup and I show adding in the rice with the seasonings, canned tomatoes, etc. Please let me know if you have any other questions. I hope you enjoy the golumpki soup. I made it tonite but it looks like I have too much cabbage. What does it mean when you say small to medium cabbage? How many pounds is that? Caroline, we’ve never measured our cabbages but suggest you use one of the smallest ones you can find. Thanks for the question. I eaten stuffed cabbage so many times but never made it myself. This looks so simple and easy. We love cabbage rolls so this soup would certainly be welcome at our table. It so simple that it would be easy to whip this soup up in no time. We’ll be making this soup soon. Cooler weather is now here. Wow and Wow !!! My family loves soups. And the recipe of your soup looks really tasty. An interesting mix of ingredients. Great idea for dinner. I think that this recipe will be one of my favorites. I love cabbage! 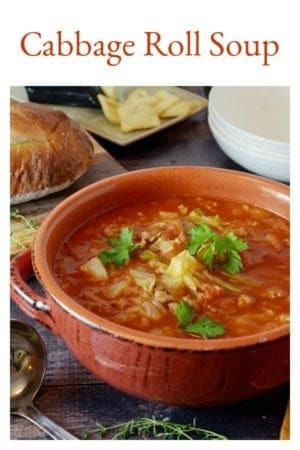 What a great idea to turn cabbage rolls into soup – yummy! we love this kind of soup and big cabbage fans. We call it deconstructed cabbage soup rolls. lol yours looks great and I love the color! Mmmm!!! My kinda meal, soup is my jam and I love this bowl of goodness!!! I so stocked that soup season is almost here! This looks really comforting! I’d be enjoying this all fall long! Wow! Looks so hearty and flavorful comfort food, love it! I want this allllll fall long. It hits all the right notes for me! I grew up in a big Czech family (they relocated to the States before I was born. But every Sunday we had a huge meal together and it was often traditional stuffed cabbage. I know it took them forever to make. I often miss the taste and long to eat it again but it’s a lot of work and I’ve got three kids of my own now! I can’t wait to try this soup! Thank you! What treasured memories you have from your heritage; thanks so much for sharing. We hope you try this soup sometime soon! I love stuffed cabbage. I want to try this soup and yout galumpki recipe. You’re going to love it Jane! This soup is so easy and looks absolutely delicious. Have to give it a try. And perfect for this cold weather. Thanks for the nice comments, you’re going to love this soup recipe! This looks perfect for the chilly weather!! This reminds me of a soup my nana used to make. I love hearty soups chockfull of veggies and meat! I love that you use turkey sausage! I’m looking forward to trying this. And I want to try your golumpki recipe as well. This is great cold weather comfort food. Looks delicious. I’ll be honest. 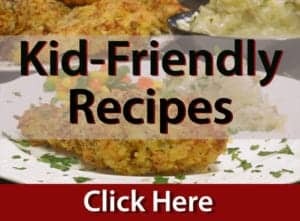 Sadly, I have never seen this site before, but I was searching for a stuffed cabbage soup recipe and stumbled across this one. This sounds fantastic. I will be making this tonight. In the meantime I’ll browse the rest of your site and see what I can find for tomorrow. Lol. Welcome to Platter Talk, Britt! Thanks for the nice comments and I hope you try this soup and much much more! Thanks so much, Jo! Give these a try this weekend! I’ve never had stuffed cabbage either but I am loving all the ingredients listed in your recipe. I’ll have to try it!